The Air Jordan 6 continues to shine throughout 2014 thanks to the silhouette celebrating its 23rd anniversary. Last weekend the model was subject to another cause for celebration since it was the signature worn during Mike’s first title win against the Los Angeles Lakers with the ‘Celebration Pack’. Now the sneaker will help Jordan Brand celebrate an the World Cup. While it might seem like a stretch – giving a basketball sneaker a colorway to celebrate a completely unrelated sporting event – we can’t complain when the colorway is sure to turn heads. 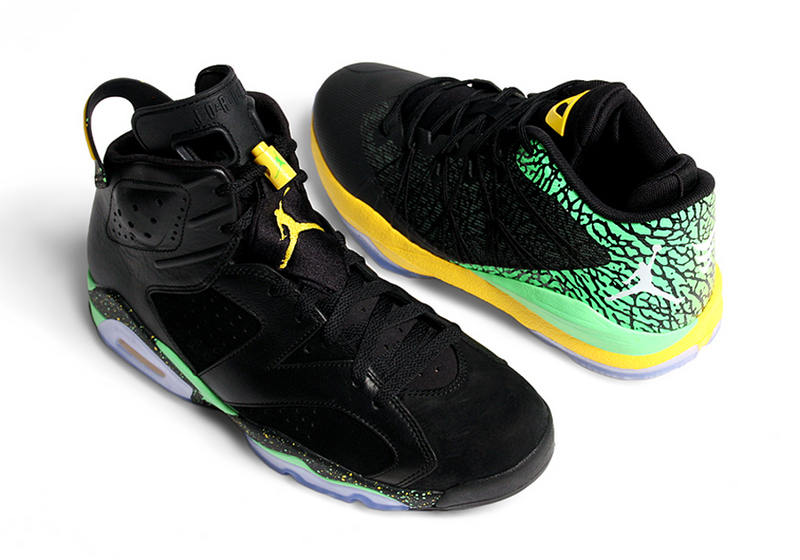 The Brazil Pack will release this weekend, and a surprising addition to the nod at the 2014 World Cup is the Jordan CP3.VII AE which features a vibrant elephant print in a green to yellow gradient on the heel. The shoes will release together for a total of $500 and are only limited to 2,000 units, so with that being said, do you plan on attempting to pick up the collection? Hit the click for more images of this weekend’s super limited Air Jordan Brazil Pack and see if you can pick up the set early on eBay.